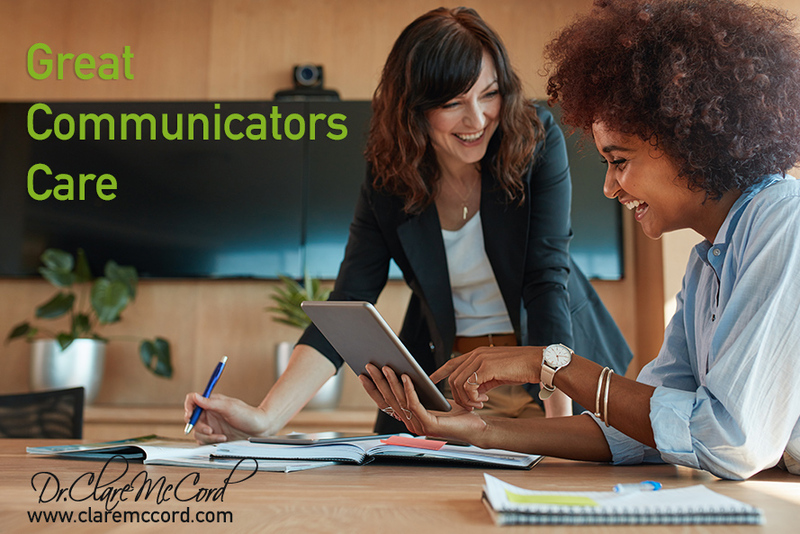 Although a primary goal of communication is to be understood by others, 100% of the successful leaders I have interviewed for my upcoming book agree that a communicator’s first job is to understand and connect with the other person. As one interviewee said, “It has to be about them first.” Briefly stated, they care. My subjects often called the skill involved “listening,” but as they detailed the components of listening, what they described was less a skill than it was an intention and a habit of mind. To care actively involves a way of thinking and being characterized by enhanced awareness of others and motivation to understand and connect with them. This mental foundation motivates a great communicator to function beyond the ego-self, so they create environments for productive, creative interaction – and they get results. Interviewees stressed the importance of self-awareness to remove internal obstacles, and of developing greater openness, curiosity, and a desire to learn about and from others. All expressed a core belief in the value of every person. Practice a larger type of listening, where you can hear so much more. Learn to ask questions; show you have done your homework and are focused on them. Be willing to go to a ‘third place’ that is neither yours nor theirs, but a new place where you can both learn. Earn the right to be heard. Don’t just expect it. You build up accounts with people and if you are in a deficit situation, that’s not good. People know when you are present and authentic. Communication is really all about caring. It goes beyond words. Many thanks to all my interviewees for your rich insights and practical wisdom. Please join me as I share more pre-views from my book and reach out if I may be of service to you or your organization. Together we can create a new world of improved communication.